Are you ready for the weekend or what? I know I am. Tuesday was my husband’s and my anniversary (year number three baby)! To celebrate, he surprised me with a mini vacation (how cool is that!? )—I’m so excited! We are leaving tomorrow morning, driving up to Idaho Falls, and dropping off the little one with Grammie and Grandpops. I don’t know everything he has planned, but I know it will include, dinner, a movie, and a night stay at a sweet hotel (pretty awesome, right)! But, before I take off, I want to share some more rad graphics with you. 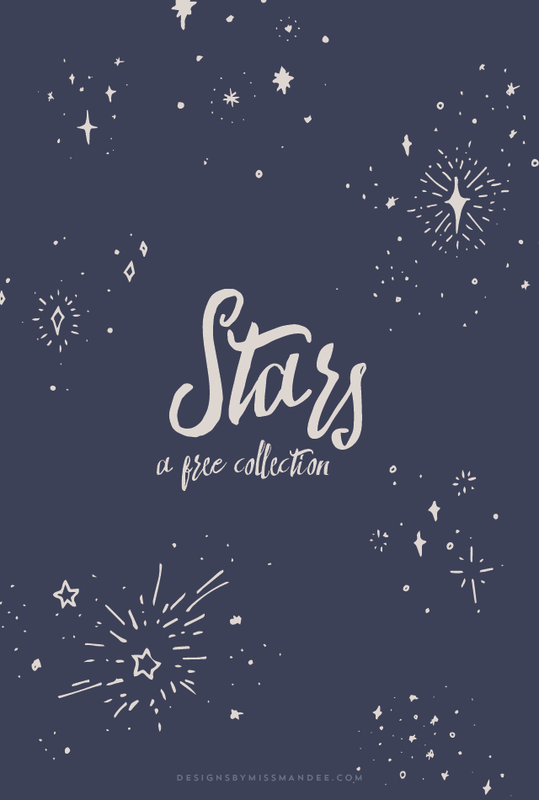 Presenting, the lovely star collection! These stars have such a fun effect! I think they would look just perfect as part of a nursery print…hmmm, I think I might just steal my own idea. They could also create a cool texture or pattern for a background. What do you think? These star motifs remind me of a design I created a while back for Adventures of Mel. I guess I just like the “night sky” theme. If you like these graphics, be sure to check out some of the other ones I’ve posted recently; including these rad hand drawn sunbursts, and some tasty summer clip art. I’ve got lots of design freebies if you’re looking to build your stockpile (I know I always am)! Well, I’d better start packing for my trip now, but I hope you enjoy my star clusters! Put them to good use and make something amazing. What do you plan to create first using these star motifs? Yeay-happy anniversary (and what a fun getaway :)! These stars are lovely! Thanks so much Amy!! Yeah, we had a blast. Cute designs!! i love it ♥ Thank you for sharing!! Hi there! I’m wondering if it would be okay to use these graphics for my church’s advent series slide? These are really beautiful and I think they would be nice for a background.